Peppermint and spearmint have been used for countless years in tea to ward off things like indigestion, common cold and flu, and anxiety. You can use mint in teas, smoothies, or even ice cream! 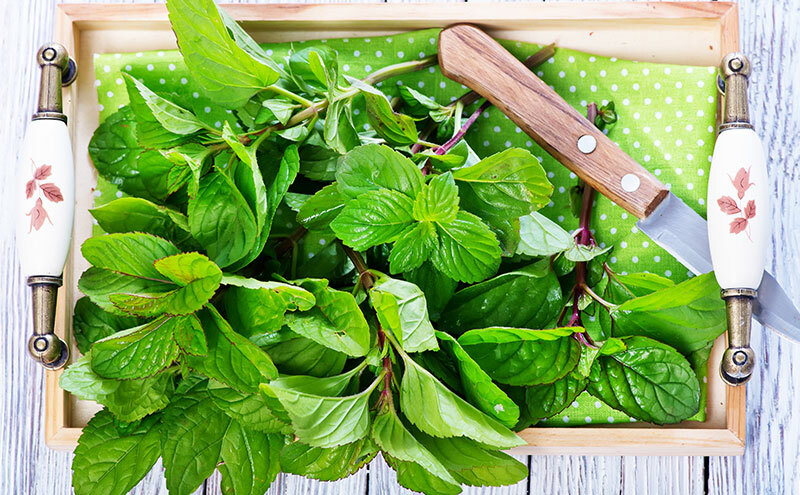 Mint is great in salads and if you love the taste of fresh mint you can find endless recipes online. It’s a great herb to grow inside your home. Thankfully, mint is pretty hard to kill! Peppermint and spearmint are actually some of the easiest plants to grow for beginners. The plants require very little maintenance and can adapt to any type of soil you may use. Additionally, they can often survive in even deeply shaded conditions – while most other plants require direct, bright sunlight. In fact, mint often grows too well! In outdoor gardens, mint can sometimes be invasive and try to take over the entire garden. It’s one reason that it’s a good idea to grow mint indoors. Mint is an excellent addition to a windowsill full of kitchen herbs. You can use mint in all kinds of cooking—it’s especially popular in Mediterranean dishes, but it’s also great in drinks (think mint julep or mojito) and desserts (chocolate and mint, anyone?). Traditionally, mint has also been used in medicine. Dried mint is made into tea that’s great for stomach aches, and if you’ve ever used a minty-scented muscle rub, you’re familiar with the cooling sensation of menthol, which is produced by mint plants. It’s quite easy to grow mint indoors. It’s a low maintenance plant and a heavy producer, so you’ll get a lot of bang for your buck even if you can only plant a small container. Go for a wide, shallow planter, as this encourages your plants’ natural tendency to spread and sprawl. Peppermint and spearmint both often grow to about 12 to 18 inches once mature. So choose an area in your home that can accommodate your plant. Somewhere near a window will be great but keep it away from sources of heat like fires or radiators. Like most other plants, the most common method for starting your peppermint plant is from a seed. The easiest way to get peppermint started is with a seed tray – this video should help you get started. Fill a shallow planter with seed starting mix and wet the soil thoroughly. It should be damp but not soggy. Sow your seeds right on top. Like lettuces, mint seeds need light to germinate. Keep them in a warm, bright place, and mist with water to keep the soil damp. Avoid overwatering or your seeds will mold. Once your seedlings have at least two sets of true leaves, they’re ready to move into pots of their own. On the other hand, the fastest way to grow mint is to start with a plant from your local garden center. I know, it feels a bit like cheating, but these larger plants are ready for light harvesting right away, so if you’re in a hurry to cook with fresh mint, that’s your best option. Most people opt for clay pots when growing outdoors – however since we’ll be growing this indoors, it’s best to opt for plastic pots. Plastic pots do not lose moisture as quickly as clay, making plastic pots lower maintenance. Mint also grows well from cuttings or divisions, so if you’ve got a friend with a plant or two, ask if they’d be willing to share. If a stem or runner already has roots, plant it right away. If not, leave it in a glass of water in a sunny place until roots appear. A word of warning about taking cuttings from unknown plants. Mint plants are very distinctive in appearance, with square stems and opposite pairs of leaves. You can spot a mint a mile away, but it’s much harder to tell what kind of mint you’re looking at, and not all mints are safe to eat. Pennyroyal, for example, is often used in landscaping and looks a lot like edible mint plants, but it’s poisonous to people and pets alike. If you’re not 100% sure what type of mint you’re taking a cutting from, play it safe and don’t do it. Your seeds will take, on average, about 7 to 14 days to sprout from the seed. You will need to keep your soil at about 70F and moist enough to ensure proper growth and ensure your plant remains alive. Peppermint is a very resilient plant, however, you can never be too safe. After about two months if you start your mint from a seed, or much shorter if you buy your mint outright. You can start to harvest your mint. Once you have multiple stems ranging from about 6 to 8 inches long you can begin to pinch off the leaves. It’s important to note, however, that spearmint is actually much more vigorous in its growth cycle than peppermint. Spearmint takes only about 90 days to grow to full maturity – about two feet – meaning its growth rate is much quicker than that of peppermint. As is the case with any plant, there are a few extra steps you might want to take into consideration to make sure you get the most from your plants. For example, the best tip one can get would be to pick in the mornings if possible – as that is when your plant is at its most flavorful. Another tip is to avoid using a fertilizer with mint. Some people may think fertilizer benefits every type of plant, but it’s actually not really necessary for mint. Mint grows fast and in great quantity, as it is, so fertilizer would have no real benefits for peppermint or spearmint. Mint plants need quite a bit of water, and probably need watered 3 or 4 times per week. You want to keep the spoil moist but be careful not to give it too much water. Overwatering is one of the reasons that your mint plant might die. Plants can only focus on one type of growth at a time. Either they’re working on growing bigger (adding more leaves and stems) or they’re putting their energy into producing flowers and seeds. Since the harvestable parts of the mint plant are those tasty leaves, you want to help the plant focus on producing more of those. Clip off any flower buds that appear to encourage more leaf growth. Mint plants can also get root bound fairly quickly. In addition to true roots, mint plants send off stems underground to help spread the plant further. This is why they’re a nightmare to contain in a garden. In a pot, though, you can help keep your plant focused on above-ground growth by harvesting regularly. Even with regular cutting, though, your plant will eventually reach the end of its useful life in a pot. The stems will get woody, and the plant will eventually get root bound and use up all the nutrients in its soil. Thankfully, mints are easy to propagate from cuttings, so you won’t even need to buy a new one! Remove the plant and refresh the soil in the pot. Before you discard the plant, take a four to six inch cutting from the tip of one stem. Strip away the leaves on the bottom two thirds of the stem, and leave it in a sunny place in a glass of water. Within a week, you’ll see roots beginning to emerge. When they’re at least half an inch long, repot your mint, and let it grow! Wait to harvest until it’s well established and sending up multiple stems, but keep trimming away any flower buds that appear. Spearmint vs Peppermint: What’s The Difference? There are hundreds of different varieties of mint, including a range with flavors like pineapple, citrus, and even chocolate! But the types of mint that most people are familiar with are peppermint (Mentha piperita) and spearmint (Mentha spicata). Both peppermint and spearmint grow well in containers, and under the same conditions. The flavors, however, are quite different, so the best type of mint for your purpose really depends on what flavor you prefer. For starters, both can be used in teas for any of the reasons mentioned previously in this article. Spearmint has a sweet flavor, with the same familiar, refreshing touch of peppermint. Peppermint, on the other hand, is also sweet – but packs much more of a punch. Peppermint has a stronger menthol flavor than spearmint due to peppermint plants having a much more concentrated amount of it—40% for peppermint, versus about 0.5% for spearmint. As a result, if you want a stronger, more menthol-like flavor, opt for peppermint – or opt for spearmint for something less strong. Spearmint is more commonly used in cooking, since menthol is a very overpowering flavor and some people find it acrid when heated or combined with other flavors. Peppermint, on the other hand, is commonly used in desserts—especially cold ones where the cooling sensation of menthol is a bonus—and in peppermint teas. The easiest way to tell which mint you’ll like best is to try them. In the spring, your local garden center will probably offer a whole host of options for mint plants. Take a small leaf from each plant—you’ll only need one, as these flavors are strong!—and crush it between your fingers. Smell and taste the leaf to get a sense of its flavor potential. Who knows? You may find you love both! With all this information in mind, I hope you have everything you need to start your mint-growing journey. What did you think of the article? Feel free to give us your thoughts – and progress stories – below! Growing mint indoors is quite easy, and certainly better for your sanity than trying to keep it contained in an outdoor garden! Choose the variety with the flavor you prefer, plant it in a shallow container that gets plenty of light and don’t overwater. When your plant’s stems start to get woody or tough, it’s time to take a cutting and re-root a new plant so you can keep enjoying mint for years to come.